Swap out campfire for oven. Swap out stick for plate. Preheat oven to 350 degrees F. In a mixing bowl, whisk together eggs and sugar thoroughly combined and pale yellow. Whisk in melted butter, cocoa powder, evaporated milk, and coffee liqueur. Set aside. melt). Continue baking until marshmallows are golden brown. Let cool slightly. Serve warm. It’s gooey and I like the hint of liqueur along with the cocoa. The marshmallows make it fun, but a little sticky. And now we’re off with the kids for Mother’s Day dinner. Canolli Joe style. So much for desert. 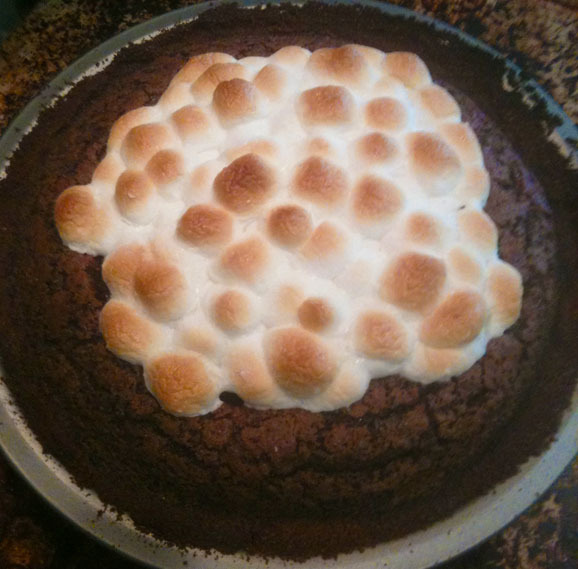 This entry was posted in Chocolate Pies, Graham Cracker Crust Pies, Unique Pies and tagged Baking, Dessert, kahlua, marshmellow, Pie, Recipe, s'more by pieofthebeholder. Bookmark the permalink.